We are highly acclaimed in the industry for offering an optimum quality range of Steel Tire Wire Scrap. We have our factory in U.S.A and we are able produce also clean tyre wire impurity under 2%. Tyre bead wire is a high carbon metal, radial tyre bead wire is 1.6 mm and nylon tyre bead wire is 1.10mm. Bead with can be used in converting to shot blasting, high tension springs, wire mesh, wire baskets, nails, cutting tools. Since this is extracted from tyres it is available at a very reasonable rates. I. K. Samnani & Co.
Tire Wire Steel Scrap is produced from tires. Packed loose in jumbo bags. Being a customer oriented organization, we are deeply engaged in offering a wide array of Steel Wire Scrap. Supported ourselves with proficient amenities, we are readily instrumental in providing Tyre Wire Scrap. 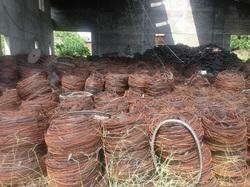 These tire wire scraps are provided in bulk and urgent orders as per the needs and demands of our customers. We provide these at very reasonable rates within promised span of time. With an intention to enhance the standing we have built, we are occupied in offering a wide collection of Wastage Tyre Wire Scrap. We offer these at market leading rates. We offer them in various packing options.